From 23rd December an Ashra (10) of Majalis has started in Mehfile Mohibbane Husain, gate no.5, plot no.3 Malony Colony, Malad (west). This will continue till 3rd January 2012 daily at 8.30 PM. 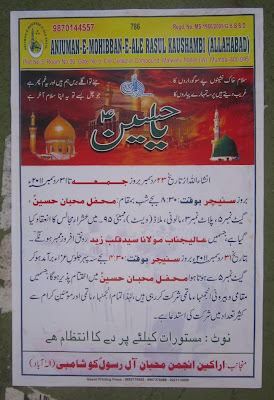 This Ashra is organised by Anjumane Mohibbane Aale Rasool (s.a.), Koshambi (UP). Maulana Sayyed Qalbe Zaid will be the Zakir.